In this article, we shall look at risks and benefits of vaginal birth after Caesarean section, management of a VBAC delivery, and special considerations. Approximately 20% of women worldwide will deliver via Caesarean section, and counselling patients about vaginal birth after Caesarean section is becoming increasingly important. It is known that a planned vaginal birth after Caesarean section is clinically safe for the majority of women who have had one prior lower segment caesarean section (as per NICE, RCOG and ACOG recommendations). The current success rates for attempted VBAC lie at 72-75% – however this is higher if the woman has had a previous vaginal delivery. Indeed, the strongest predictor of success in VBAC delivery is a successful previous VBAC (85-90% success rate). More complex circumstances such as multiple pregnancy, macrosomia or maternal age >40 years old (see risk factors for uterine rupture below) require a more cautious approach and should discuss their care with a senior obstetrician. Table 1: Comparison of VBAC and elective Caesarean section. Uterine rupture refers to a full-thickness disruption of the uterine muscle and overlying serosa. The fetus can be extruded from the uterus, resulting in fetal hypoxia and large internal maternal haemorrhage. The greatest risk factor for uterine rupture is a previous Caesarean section – monitoring and recognition is a key principle of a VBAC delivery. Previous Caesarean section – classical (vertical) incisions carry the highest risk. Although infrequent, rupture is an obstetric emergency that requires an ABCDE management approach with delivery in theatre. 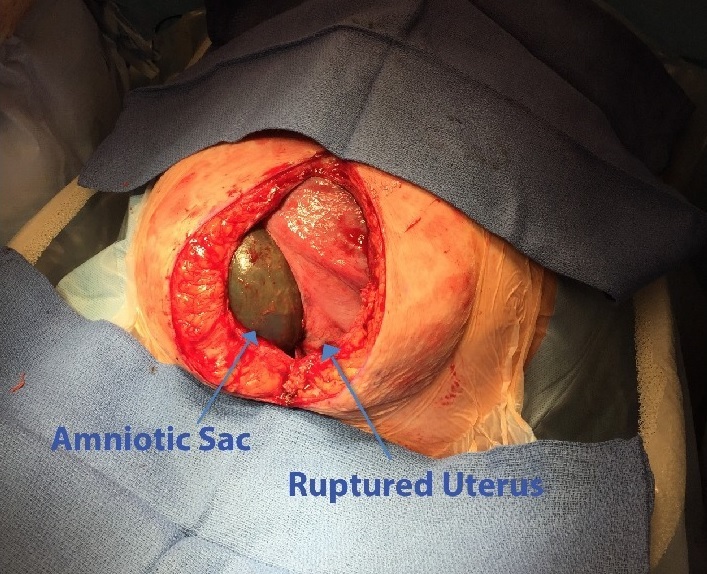 For more information see our article on uterine rupture. These women should deliver in a hospital setting with facilities for emergency caesarean and advanced neonatal resuscitation. There should be continuous CTG monitoring. Beware of additional analgesic requirements during the labour as may indicate impeding uterine rupture. If induction is required, the risk of uterine rupture is less using mechanical techniques (e.g. amniotomy) than induction with prostaglandins. Any decisions about both induction and augmentation require input from a senior obstetrician. After 39 weeks an elective repeat caesarean is recommended delivery method. There is a 2-3 times increased risk of rupture and 1.5 times increased risk of emergency Caesarean in induced/augmented labour vs spontaneous VBAC labour. The contraindications for VBAC can be divided into (i) Absolute – under no circumstances should a VBAC be considered; and (ii) Relative – decisions should be made on a case-by-case basis by a senior obstetrician. Absolute – classical caesarean scar, previous uterine rupture and any other contraindications for vaginal birth that apply to the clinical scenario (for example placenta praevia). Relative – complex uterine scars or >2 prior lower segment Caesarean sections. Most women with previous caesarean section have the option of a planned VBAC or elective repeat section. VBAC have relatively high success rates and these are even higher if they have had previous vaginal delivery. VBAC deliveries are classified as high risk and require close observation and careful management. There are both absolute and relative contraindications to VBAC to be aware of. Uterine rupture is an emergency that is of critical importance to recognise. Which of the following is an absolute contraindication to VBAC? Which of these is NOT a risk factor for uterine rupture? Which of these is FALSE about the management of a VBAC delivery? Which of these is true about elective repeat Caesarean vs VBAC? What is the success rate of a VBAC?